Over the last few months, we’ve been exploring the Internal Genres, an adventure that’s only increased the farther and deeper we go. 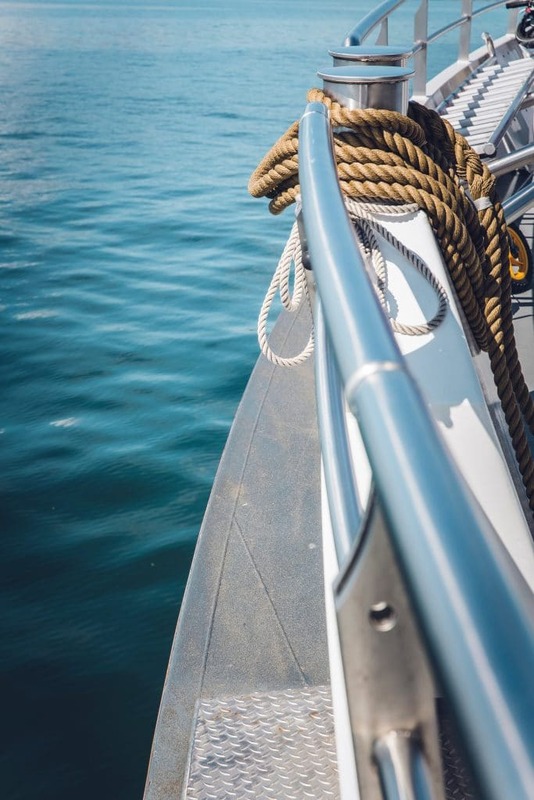 When we set out from the shore, our desired destination was to understand the what makes each Internal Genre unique, how they are different, and how they are connected. So we (and our clients) can execute them well. We didn’t have an exact route, but a collection of maps drawn throughout the ages: the Story Grid, Friedman’s Framework, and the Hero’s Journey, among others. Through our exploration in Part 1 and Part 2, we confirmed that Genres aren’t a random list of rigid rules, but the sum total of a specific change experience. They really do have specific distinctions and that is what makes them meaningful. We were certain the next leg of the journey was Obligatory Scenes (and it is, sort of) but we were in for a surprising but inevitable discovery. So grab your Story Grid Goggles (patent pending) because it’s time to get out of the boat. A deeper understanding and appreciation of Story, and the Story Grid methodology, awaits. First we looked at internal genres from the perspective of Friedman’s Framework. We wanted to distinguish among the three main internal genres and twelve subgenres because they can be confusing. From the work of literary critic Norman Friedman and studying twelve Masterworks, we learned that not every character is capable of every internal genre. The right kind of protagonist with a specific combination of moral character and sophistication of thought. The protagonist is exposed to specific external circumstances, including opportunities, challenges, and mentors. The external circumstances produce a specific kind of change for the protagonist so that they are better or worse off than they were at the beginning of the story. From these elements, we can draft a cause and effect statement that describes the essence or pattern of a satisfying story readers recognize and draw meaning from, though they may not be conscious of it. In our next post, we looked at how to create the pattern and execute the arc of the cause and effect statement across an entire story? We explained that story events and turning points shift specific Life Values from the beginning of the Story to the end. Everything we covered in Internal Genres part 1 and part 2 relates to the first of the Editor’s Six Core Questions: What’s the genre? In this context, we mean the Content Genre leaf of the Story Grid Five Leaf Clover. Friedman’s Framework describes the specific change to the specific protagonist that answers that question for the internal genre. Once you determine the genre, you’ll know the Life Value at Stake for the pattern. 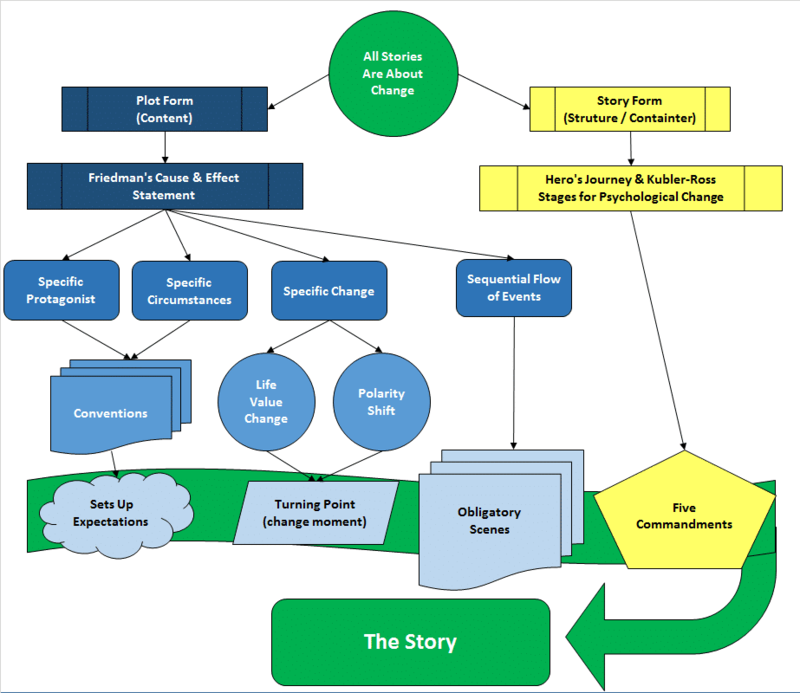 To create the arc that represents the pattern, the Life Value must change along the spectrum in a specific direction and incrementally through story events. Those story events are the subject of the second of the Editor’s Six Core Questions: What are the conventions and obligatory scenes for the global genre? Writers want to tell stories that work, ones that resonate with readers and meet their expectations. Shawn Coyne tells us that reader expectations are set up by the genre conventions and we pay them off by executing and innovating the obligatory scenes of the global genre. Once writers hear that there are obligatory scenes for the story they want to tell, they immediately want to know what they are. That’s only natural. But knowing what the obligatory scenes for your genre are without understanding where they come from and what they’re meant to accomplish won’t necessarily give you everything you need to tell a satisfying story that meets reader expectations. So providing these must-have scenes, without more, can actually be counterproductive. In this post, we’ll provide a foundation to help you better understand them so you can tell better Stories. To chart our course to the unknown, we start in familiar territory, with what we already know. Stories aren’t just fun and entertaining, they are essential for survival. It could be a simple story that tells us which mushrooms are safe to eat, or a more complex story about the dangers of abandoning our moral compass while attempting to rise within society. As Shawn says, the most dastardly villain we face is our state of being. No, it’s not specifically “outer space” or “a rock” or “a snowstorm.” It’s the implacable foe that each and every one of us stares down and then retreats from every single conscious moment of our lives. We know very little about what makes the world go around. Physically or spiritually. Many of us spend our lives searching for some kind of answers to the deep questions that plague us all. If we can never know for sure what makes the world go around, why do we try? Because it often makes things better. Stories allow us to make sense of the world, even if our understanding will never be complete. Stories are the way we make sense out of the events of our lives. Individually and collectively we tell stories in order to understand what has happened to us and to create meaning from those experiences. Storytelling is fundamental to all human cultures, and our shared stories create a connection to others that builds a sense of belonging to a particular community. The stories of a particular culture shape how its members perceive the world. In this way, stories both are created by us and shape who are. For these reasons, stories are central to both individual and collective human experience. For as long as humanity has existed, we’ve told prescriptive (do this) and cautionary (don’t do that) tales to bring order to a chaotic and ever-changing world. Though they have changed mediums–from the oral tradition to hieroglyphs, papyrus to the printing press, and now in the digital age–stories always have and always will be a means for helping us cope. Because change is always hard, even when it’s for our own good. But why stories specifically? Why the whole beginning, middle, end thing? Why not simply pass on unadulterated information? Because unadulterated information is easily forgotten. Our working memory has limited carrying capacity, a mere three to five items (good luck with those mushrooms) so without stories, we’d be dead. Stories transform bare facts into patterns that our subconscious minds can recognize–and remember. A case in point is how memory champions use loci (or mind palaces) to remember loads of information. They connect the facts to Stories. For a more practical application, consider constellations. A night sky full of stars is beautiful, but it becomes useful and infused with meaning when we connect them to form images, and even more so when we connect those images to Stories. Before there were proper calendars people had no way of determining when to sow, or harvest except by the stars. Constellations made the patterns of the stars easy to remember. The ancient peoples knew for example that when the constellation Orion started to be fully visible winter was coming soon. Or they could look at the Summer Triangle to know when Summer or Spring were coming as well. The stars allowed farmers to plan ahead and form agriculture, and constellations made it easier to recognize and interpret the patterns in the sky. Stories are a human pattern imposed on life circumstances to convey information and meaning and help us make sense of and deal with a changing world we can’t control. People like Aristotle, critics R.S. Crane and Norman Friedman, writers like Robert McKee, and editors like Shawn Coyne study these patterns closely. Their work helps us distinguish one pattern or form from another and check our work for the necessary ingredients before sharing it with our readers. That’s what stories are meant to do, but how do they do it? Friedman wanted to understand what makes one Story different from another—beyond a recitation of specific facts. After all, the same circumstances, characters, and events can give rise to a wide range of vastly different stories. He proves the point with these simple story events: “protagonist meets loved one, wins loved one, loses loved one.” These story events are brought to life within the covers of Tess of the D’Urbervilles, Sons and Lovers, The Great Gatsby, A Farewell to Arms, and 1984, and each one seems worlds apart from the others. Circumstances, characters, and events do distinguish story patterns, but not alone. It’s their relationship of these elements to the Story as a whole that produces the patterns of meaning we call plots. The plot form consists of these elements. There is an additional piece that comes from Friedman’s framework that we haven’t emphasized, and we mention it now because it’s relevant to the obligatory scenes and conventions: The pattern or form that Friedman outlines produces “a sequence of imaginative response in the reader.” In other words, the pattern of story events evoke certain emotional responses in the person who reads it. We’ll come back to this in a bit. A certain kind of protagonist with a specific combination of moral character and sophistication of thought who is exposed to specific external circumstances, including opportunities, challenges, and mentors, changes in a particular way so that they are better or worse off than they are at the beginning of the story. We call this Friedman’s Framework, a cause and effect statement that identifies a specific pattern that becomes the form of the plot or the content of the story. We mentioned these statements in our first post on internal genres and applied them to twelve examples, one from each of the internal content genres. When a sympathetic protagonist, with naive black-and-white views of the world and mistakenly conceived goals, experiences a loss or trial that shows them the world is multi-layered and imperfect, they embrace better-suited goals and actions. When Tony Manero, a talented dancer with racist and sexist views who mocks planning for the future, meets a woman with positive ambition and witnesses painful events that disrupt his narrow views, he becomes dissatisfied with his life in Brooklyn and chooses to grow up beyond Saturday night. The elements (specific character, circumstances, and change) and their relationships to the entire Story create the cause and effect pattern we use to create a concise statement that is the main lesson of the Story—the primary takeaway. In the Story Grid world, this becomes the Controlling Idea/Theme, which is the subject of the fifth of the Editor’s Six Core Questions. Now we have a concise and clear statement of the content genre or plot pattern, and that is wonderful, but how is it useful? What cast of characters is required? Type of protagonist: This convention comes directly from the cause and effect statement: a sympathetic protagonist, with naive black-and-white views of the world and mistakenly conceived goals. Tony Manero is a talented dancer with racist and sexist views who mocks planning for the future. Shapeshifters as hypocrites: This convention comes from masterwork studies and an understanding of the plot form. The character(s) in this role prompts cognitive dissonance: They say one thing and do another, which upsets the protagonist’s black-and-white worldview. Frank Manero (Tony’s brother) is a Catholic priest and the favorite of the family, but he leaves the Church because he was living a lie. Frank tells Tony the only faith he had was in his parents’ dream of his becoming a priest. Stephanie Mangano (Tony’s dance partner) acts as if she is more mature than Tony and living a successful and put-together life in Manhattan. But she actually struggles with the transition, needs help, and often does not know what to do at work. The disco club holds an annual competition for the best dancing couple, but Tony’s friends there award the prize to Tony and Stephanie, even though a Puerto Rican couple were clearly the best dancers. Strong mentor: This convention we find from examining masterworks and real life. If you’re going to metabolize new information and adopt a new understanding of the world, you need someone who is more sophisticated than you to help you make sense of the chaos of cognitive dissonance. The character(s) in this role gives the protagonist the timely guidance they need to see the truth. Frank Manero (Tony’s brother) begins living a more honest life and encourages Tony to think for himself and pursue his dreams, not just what “they” want to you to do. Big Social Problem as Subtext: This convention creates the opportunity for the protagonist to observe their black-and-white thinking. It’s connected to the truth the protagonist is unable to see. In Brooklyn in 1976, racism and misogyny are common. Racial slurs are used in everyday speech by Tony and his friends. The opening sequence shows Tony ogling women on the street, and for Tony’s friends, Saturday nights at the disco include stealing away to the backseat with a woman they’ve just met. Tony’s father doesn’t let Tony clear the table, calling it women’s work. What methods are required to move the plot forward? Loss or trial that shows the world is multilayered and imperfect: Like the shapeshifter, the loss or trial creates cognitive dissonance. Life is not going the way the character expected. Even if the world seems more favorable to the protagonist, the change is uncomfortable. Losing his friend Bobby on the bridge (after already being shook up from unfairly winning the dance competition) is the final straw for Tony. At this moment, he becomes fully aware of what his life and the neighborhood truly are. He leaves and rides the subway all night, arriving in Manhattan the next morning, and asks for Stephanie’s help in starting a new life. Win-but-lose or lose-but-win bittersweet ending: All change, even when it’s for the better, is a loss. To gain sophistication, we must drop our old worldview, which provides a sense of comfort or security. Growing up ain’t easy. It’s a net gain, but it costs you something to advance to the next level in the hierarchy of needs. Tony gains a higher understanding of the world when he recognizes his life and neighborhood for what it truly is. This knowledge forces him to leave behind his family, friends, and Saturday nights at the disco. Given who Tony is, and the circumstances he experiences, the audience expects that he will realize there is more to life than the here and now and his next opportunity to dance. He works hard and practices, and we know he can pursue a larger vision for himself. When he acts on his new awareness, we feel a form of righteous satisfaction. Knowing what the conventions are for the genre and that they lead to the reader’s expectations is really useful information. But how do you execute the payoff of that setup? To find out, we return to Friedman’s Cause and Effect Statements. Remember, that tells us that the elements are the specific protagonist, in specific circumstances, experiencing a specific change. When these points are combined, they represent a full value spectrum: Negation of the Negation to Negative to Contrary to Positive. From the cause and effect statement, we can tell that the Worldview Maturation protagonist moves from naive, black-and-white views of the world to understanding that the world is multilayered and imperfect. From that statement, we get the primary negative and positive life values, NAIVETE and SOPHISTICATION. In Saturday Night Fever, Tony begins at NAIVETE MASKED AS SOPHISTICATION and ends at SOPHISTICATION. This cause and effect statement also gives us the polarity change or Value Valence Change, which is the judgment we assign to the live value shift. The life value could be characterized as a shift from good to bad (+/-), bad to good (-/+), good to great (+/++), or bad to worse (-/–). Generally speaking, the Worldview Maturation protagonist begins with some form of NAÏVETÉ and moves to SOPHISTICATION, which is movement from the negative or double negative value to a positive one. In Saturday Night Fever, Tony’s life value moves from the negation of the negation to positive (–/+). Understanding the specific change, brings us to the sequential flow of events that bring about the change, in other words the obligatory scenes. Obligatory Scenes are “the must-have elements to pay off the raised expectations of those conventions.” More specifically, you could say they are “key events, decisions, and discoveries … that move the protagonist along on her/his journey.” (Definition from Kim Hudson in The Virgin’s Promise). How do you know which key moments are really necessary? Chances are you can feel them because these key moments will evoke emotional reactions in the reader. These are the moments that matter. But if you want to get more specific, and we know you do, let’s consider again what stories are about. As we’ve said before, individuals (and societies) don’t embrace change. The bottom line with change (and change is the substance of Story) is that it requires loss. Even when change is positive, we lose something of ourselves coping with its effects. Lottery winners are a great example of the monumental effect of positive change. So the key events, decisions, and discoveries of the plot should be ones that would force a protagonist to accept (if not embrace) change—or suffer the resulting consequences. But things get a bit tricky here, so we’re moving through this slowly. Story is made up of structure and content, which you could also think of as a container and its contents. The content elements of the Story include the ingredients or plot. The Friedman article we’ve referenced focuses on plot. The structural elements of the Story are often called story form, which can be confusing. For this discussion, we’ll refer to structural and content elements and capitalize Story when we’re referring to the union of content and structure. Among other things, the structural elements include the Five Commandments of Storytelling and the units of Story. The scenes that create the structure of the Story could be the steps in the Hero’s Journey, the Kubler-Ross change curve, or a mini-plot structure. These scenes are related to the Structure Leaf of the Five Leaf Genre Clover. Here’s an example of the relationships between content and structure. As we mentioned earlier, we get the life value shift and value valence change from the specific change in Friedman’s cause and effect statement. These tell us what the content genre is. Knowing those elements, we can find the specific moment in the Story when the life value actually shifts from one state to another. That moment is the Turning Point, which is the progressive complication that forces the dilemma or Crisis Question. The life value shift, polarity change, and turning point together help us spot whether the Five Commandments of Storytelling are working. Genre conventions are content elements or ingredients that set up the particular change in the protagonist and create reader expectations and emotions that must be paid off. The obligatory scenes are the key structural scenes that pay off the reader’s expectations. Let’s walk through the Obligatory Scenes of the Worldview Maturation genre and our masterwork example. An Inciting opportunity or challenge: The first encounter with someone or something that pokes at the protagonist’s existing black-and-white worldview. Tony complains to the DJ about the salsa music, claiming that “you can’t dance to it,” but then sees Stephanie dancing, clearly proving him wrong. Protagonist refuses to accept the opportunity or challenge to their worldview: The protagonist refuses to acknowledge their NAIVETE (and often NAIVETE MASKED AS SOPHISTICATION) and doubles down on their current way of thinking. Tony’s friend tells him to go ask Stephanie to dance, but he refuses, and later dances with women he doesn’t like at all. Forced to respond, the Protagonist lashes out against the requirement to change their worldview: The protagonist reacts in anger to cognitive dissonance that upsets their worldview. Protagonist learns what their external Antagonist’s Object of Desire is: The character uses what they learn to adjust their approach to getting what they want. Tony’s parents treat him poorly and wish he was more like his brother, Frank, a Catholic priest who is the pride of the family. Protagonist’s initial strategy to outmaneuver the Antagonist fails: They’ve tried multiple approaches to get what they want (their external object of desire), and they’ve been thwarted each time. Tony and Stephanie win the dance competition because they are the Italian couple from the neighborhood. He refuses to accept this and gives them the trophy and prize money to the Puerto Rican couple, who were clearly the winners. During an All Is Lost moment, Protagonist realizes they must change their black-and-white view of the world to allow for life’s irony. Tony’s friend Bobby acts recklessly on the bridge, despairing about getting his girlfriend pregnant and that Tony didn’t call him like he said he would — Tony had been so caught up with Stephanie and winning the dance competition he didn’t see his friend’s need. Bobby falls from the bridge and is killed. The action moment is when the Protagonist’s gifts are expressed as acceptance of an imperfect world: The protagonist embraces the more nuanced view of life and chooses to act on it. After Bobby’s death, Tony walks away from his friends and leaves Brooklyn. He rides the subway to Stephanie’s apartment and asks for forgiveness and help to start his new life in Manhattan. The protagonist’s loss of innocence is rewarded with a deeper understanding of the universe: This scene pays off the expectation set up by the win-but-lost, lose-but-win convention. The protagonist can’t get something for nothing and must make a sacrifice. Tony’s new worldview forces him to leave the neighborhood, but now he is looking toward the future and expanding what he believes possible for people to be — himself, women, and other races. We tried an exhaustive number of approaches to accurately illustrate how the elements of content and structure relate to one another and create this wonderful thing called Story. This image represents our current understanding of how the individual elements are connected. When we reached the conventions and obligatory scenes analysis for the Maturation story, we started with the list for the Worldview genre, which might seem like an unfair advantage. But we didn’t rest on our laurels. We tested each one and discussed and debated why it was included. We asked how each item set up or paid off reader expectations in the Story. We also refined the general language to make it very specific to the Maturation subgenre. Knowing the conventions and obligatory scenes helped, but there is something that helps even more. Almost a year ago, we learned that we’d be attending the Story Grid training in Nashville in September. The five of us who had met at the Love Story Workshop in New York came together every week all summer to discuss a movie from one of the twelve content genres. The only conventions and obligatory scenes we had at the time were the ones we found in the books, podcast transcripts, and blog posts. We started with what we knew, wrestled with the elements of structure and content, and solved for what we didn’t know. We made mistakes, and still do (we’re still analyzing movies on the Editor Roundtable Podcast), but the summer spent repeatedly stepping into the unknown from the known was a superlative education. So we will share the conventions and obligatory scenes we’ve identified in our movie masterworks for each of the internal genres as time permits (check back regularly for additions to the Status, Worldview, Morality cheat sheets). But we understand from our experience that the list without understanding what they are and where they come from will not serve you. If you don’t understand them, your scenes may not hit the emotional notes to provide a satisfying experience and meet the reader’s expectations. Here’s our advice: Don’t wait for a Story Grid Editor to tell you what the conventions and obligatory scenes are for your story. Analyzing a Masterwork takes time, and we can’t do every story. The truth is, you’ll gain a greater understanding by taking the long way around. Start with what you know about the story you want to tell and choose a masterwork that is as close as you can get to it. Identify the type of protagonist you have. Identify the change that takes place from the beginning to the end of the Story. Identify the human life value at stake and how it shifts. Identify the value valence change. Identify the most likely conventions. Identify the most likely obligatory scenes. Once you’ve reviewed your masterwork and have preliminary ideas of the answers to those questions, think about what the same elements might look like in your story. Keep coming back to the masterwork and begin to review others. Whether you’re talking about Shawn, a Certified Story Grid Editor, or the ghost of Norman Friedman, we’re not the only ones who can figure this out. You can do this. You need to stop fighting the fact that a pattern exists, push through your own cognitive dissonance, and actively seek the answers that you need. What makes the Story Grid editors special (besides providing an objective perspective when you’re ready to have your work reviewed) is that we invested time and money to study story and plot form, and you can do this too. Studying masterworks is free to any who are willing to do the work. Kimberly Kessler didn’t finish college. When she was twenty-years-old, she landed an entry-level job at a local credit union which served as her on-the-job education. But after climbing the corporate ladder for ten years, she realized time is truly our most precious commodity and needed to spend hers differently. In October 2014, she quit her corporate job to pursue passion projects—and it has been the best decision of her life. Since that day, she gained a son through open adoption, wrote her first novel, and got to add TEDx speaker to her resume with her talk "I Am A Villain In Disguise." Now Kim is a Certified Story Grid Editor and gets to combine her two favorite things in the world--stories and people--and call it work. Nothing is more rewarding than helping someone else get a breakthrough on their plot and process. But most of all, she hopes to help others realize it’s never too late to live your best story. I love your articles, ladies. That plot/story form infographic is very useful. Please keep up the good work! Another thought-provoking piece! Thank you! Great work! I’m impressed with the dept of you analysis. Thank you for this excellent article, and for the whole series on internal genres. It’s outstanding, really. You’ve helped me see a bit more clearly into my own project. I keep sharing with my writer friends, so we can eventually acquire a shared vocabulary. Kimberly and Leslie, this article is gold! Thank you! This is a great article about something that I’ve been struggling with in my own story for a long time. After reading this article and trying to fit my story into it I am still struggling. I understand the general concepts but can’t figure out which parts of my story match which parts of the obligatory scenes which means I can’t find out what’s missing. My main genre is a romance plot which each character following their own sub-genre worldview maturation plot (which of course influence each other via the romance plot). I know I have maybe bitten off more than I can chew but it really is the story I want to tell. If the worldview maturation plot is a sub-genre does that mean it would play out differently? Or maybe not all the conventions or obligatory scenes need to be on the page? The feedback from beta-readers is that one of the story lines is clear and satisfying (for the most part) but the other one is vague and has less impact. Any suggestions are much appreciated! !